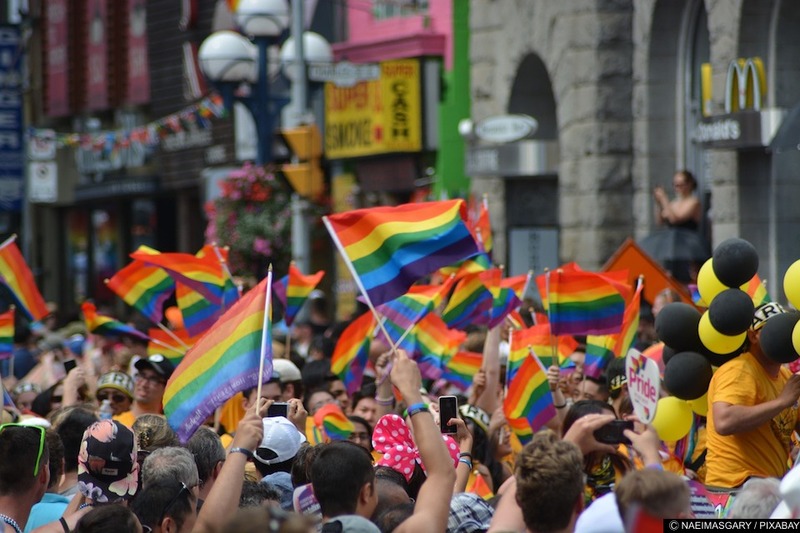 At the beginning of the German Summer, I had the pleasure of visiting the city of Dresden for the local Pride Festival, known locally as Christopher Street Day (CSD) after the street in New York which is home to the infamous Stonewall Hotel. I caught up with local fashionista Mister Matthew, to discuss being a male fashion blogger in a small city in Germany. Mister Matthew’s blog (in German) is a great source of fashion advice for men wanting to give their wardrobe a bit of European flair. Aaron Holloway: Why did you decide to make a fashion blog? Mister Matthew: I always liked to show myself on the internet. But one day, social media was not enough anymore. My boyfriend taught me the idea of creating a place on the internet, where I can do whatever I want, where I can be the boss, the leader. He created a website for me and thought me some things about web hosting. Since that day, it was in May 2014, I have my own Blog. To write about the topic of fashion was quite clear because I always loved to dress myself up. I spend hours and hours with choosing the right piece of clothing. So I made fashion and style the main topics of my Blog. But there are a lot of more things that I am talking about, just like cosmetics, travel, lifestyle, events and so on. AH: What makes your blog different from others? MM: There are so many female fashion blogger in the scene it is almost scary. As a male fashion blogger, I am a bit more unique, which I like. I do not like to compare myself too much with different bloggers, but if I have to, I need to say that I make a painting for every outfit that I show on my blog, which is quite unique. With my blog and my fashion, I always try to be political or maybe provocatively. For example last year I showed a burka experiment on my Blog, which was quite crazy. AH: Is Dresden a fashion city? MM: Not really, no. I like the architecture and the sense of art from the city. Dresden is a really nice place to live, but not a fashion city. In relation to London, Paris and Milano, Dresden is just like the people never ever heard of something more than just basic-fashion. Sometimes it’s quite depressing, sometimes It’s good because I can be more unique that way. AH: What is your favourite item of clothing? MM: My favourite item of clothing is a huge, heavy, beautiful coat. I just love autumn and winter, because I love the fashion in it so much. I could not live without a real good coat. It always looks nice in combination with leather shoes. AH: What would you say is the best part of your job? MM: The people. My Blog/my job brought me together with so many beautiful people, just like you. Writers, readers, photographers, designer, blogger… the list is endless. I just love to meet or get in contact with people because of my Blog. There have been so many in the last 3 years, it’s insane. I meet the most people because of my Blog at Fashion Weeks or Events. AH: What is the best Fashion Event to travel to? MM: I think it depends on what kind of fashion and what kind of events do you like. Some people like it bigger, some people like it smaller. For me, Berlin Fashion Week was the best Fashion Event for me to travel to. But I am pretty sure, there will be different events in the future that I’ll like more. AH: What is the best perk of being a blogger? MM: The benefit I like the most is the fact that I am able to manage my time by myself. I do not have a boss or something. I do not have a strict work plan. That is quite refreshing and after 12 years of school just really cool. AH: Are you given the clothes you feature on your blog or are they personal items that you love? MM: It’s a mixture of both things. I show a lot of things that I bought for myself, of course. But I also get featured with fashion from different labels and designers. To be honest: I really love it to get fashion for free, because I love fashion so much. And at the end of every month, my money is empty because I freaked out at the shop around the corner. AH: What advice would you have for people interested in being a blogger? MM: Just be yourself and please: be as much as creative as possible. I think the blogger scene could need a little bit more of creativity. AH: Where can we see more of Mister Matthew? MM: On my Blog, of course, or at the German television series “Diktator”, that aired a few months ago on German Television. Australian photographic artist living in a small city in Germany. I travel a lot around Europe and blog about my travels, as well as photograph the cities and people I meet.